A new breed of urbanite is beginning to make its way into our cities and no, it’s not the next millennial subculture, I’m referring to Unmanned Aerial Vehicles – more commonly known as Drones. Small drones, those weighing under 55 lbs (25 Kg) will soon be easier for businesses to use thanks to new FAA regulations being issued in August. Currently, businesses need to present their reason for drone usage to the FAA on a case-by-case basis, which can be costly and take months to finalize. Many smaller firms work with third-party service providers that help navigate the legalities of drone usage which greatly lessens the time and expense that comes with approval for the new technology. Although the new laws will only permit drone usage within the Visual-Line-Of-Sight (VLOS) of its operators; placing a hindrance on many consumer retail initiatives, the opportunity for entrepreneurs and businesses is great. Insurance, A/E/C, and photography are three industries primed for growth in drone usage. Three major insurers, AIG, State Farm, and USAA have already been approved for the use of drones for inspections. Industrial inspection is expected to be at the forefront of drone usage, for things like surveying or admitting access to places that may otherwise be unsafe or unreachable. Uses in the architectural realm includes site analysis, stitching together photos for 3D maps, monitoring construction site progress and producing photography of completed projects. Following that lead, there is significant opportunity for growth in real estate and aerial photography, where drones would aid in the production of marketing material. The usage or drones for daily commercial services is far off, however assuming the rate of technological development and that societal acceptance for the emerging technology continues, one can infer, in the future, our levitating neighbors will handle tasks from the delivery of goods to window cleaning. To adapt to services and transportation deployed at varying heights, cities must begin to develop the necessary infrastructure to accommodate our flying friends. 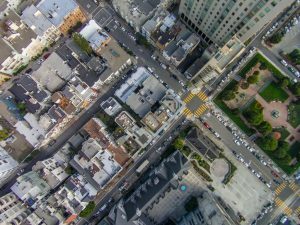 Cities planned solely for ground vehicles will need to be re-adapted and provide visual cues for drones so that they may navigate around tall buildings and conduct autonomous operations based on their programming. Only then, will we be able to benefit fully from this exciting new technology. Autonomous flying service providers that offer services that mesh with the needs current and future city inhabitants may still be several years off. However, the FAA is working to bring ubiquitous regulations regarding commercial drone usage as quickly as possible in order to make the transition seamless when the time comes. These new regulations will continue to shape and advance current industries. Those who are anxiously waiting for the end of the summer to begin experimenting with commercial drone capabilities are encouraged to download the FAA’s app B4UFLY, which lets operators know where it is safe to control drones.